Bienvenido! we're Located at 1908 Artesia Blvd., Redondo Beach, CA. Phone 424-247-9157 Open Daily 11am-7pm. Born in Monterrey Mexico, Founder and Chef Ruben Frias shares his treasured family recipes he grew up making with aunts and uncles. What resonated most with Ruben was how chiles like ancho and guajillo paired with different cuts of meats. His empanadas are a cultivation of the intense flavors of Mexico and the joy of sharing good food with family and friends”. More and more, people want to know where their food is coming from and how it was grown or raised. Our handcrafted empanadas begin with organic meats slow-cooked in Mexican chiles, filled with vegetables and non-gmo Mexican cheeses and baked to a golden brown. The Empanada Shop started out as a small USDA certified organic manufacturing plant, the first of it's kind making certified organic empanadas with non-GMO grass-fed meats, vegetables and chiles for wholesale distribution into stores like Whole Foods. 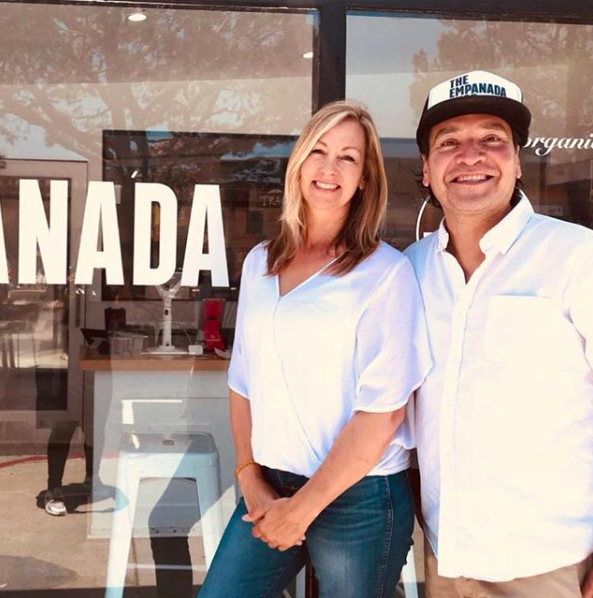 in 2017, we moved our USDA plant to Redondo Beach and opened up the front of the shop to sell hot empanadas and tamales to-go, made with organic ingredients. Taking a Sunday ride to the ranch outside of Monterrey was more than a day with family for Ruben, it was a journey of exploration in food and tradition. The terrain winds through rushing waters and bumpy roads to a remote ranch set within the mountains of Monterrey. The ranch is tucked away in a landscape of mountain ranges, vast views with ranging cattle, horses, and chickens. The casita at the ranch is unassuming, small with just enough room to gather in the kitchen. Outside the open fire grill is the smoky setting of story-telling, laughter, and a canvas for a beautiful meal. The chiles are prepped inside. Ancho chiles set in a warm pot of broth with chopped onion, garlic, cumin, and sweet paprika are worked with a molcajete into a simple, yet complex paste. This paste is the smokey, slightly sweet glaze added to the meat charring on the grill. Mama Elva presses masa into rounds for tortillas and Jorge preps the michelada's, a beer with tomato juice. Corn is placed on the grill. When ready, the flank steak is rolled into hot tortillas with fresh lime, cilantro, onions and a handful of cotija cheese. Abuelita Emma brings pots of ranchero pinto beans with garlic, cumin and onion and Mexican rice. Simple dishes with intense flavor. The family gathers, the stories flow, and the meal, as always, is the heart of the table. Ruben often reflects on these moments and how they shaped his desire to bring his heritage to a modern, organic Mexican food he created in his version of the empanada filled with organic meats, authentic Mexican chiles, and fresh vegetables. Platitos "little bites" are traditional in every region of Mexico - the empanada is the canvas that wraps the story, the art, and the flavors of generations of cooking into a modern grab and go meal. Founder/Chef Ruben is a Creative Director with an award-winning career at creative powerhouses Disney, Live Nation, Warner Brothers and innovative digital agencies. As an entrepreneur, his latest endeavor, The Empanada Shop, takes him to his kitchen in the heart of the Southbay, Los Angeles. Here his passion for food collides with his love in the creative design space and his roots for the good food he grew up making with his family.